Cornwall is not only blessed with stunning scenery, but also a mild climate that enables grass to grow nearly all year round and crops to have a longer season than in many other parts of the UK. Admittedly, this does mean we have to put up with a lot of rain, but we also get lots of sunshine. The result of all the sunshine and rain is a wealth of wonderful Cornish produce. As a vegetarian, I don’t eat meat, but I do eat dairy and Cornwall has long been known for it’s rich milk, butter and cream. Cornish cows are mostly pasture fed and out in the fields for many months of the year. This results in a milk which is tasty and full of essential nutrients. Cornish potatoes, cauliflower and daffodils are well known but most fruit and vegetables grow well here. As regular readers will know, I try to buy as much local produce as possible and I am very lucky to have such a choice. Produced within just a few miles, I can buy award winning cheeses, cider, flour, eggs, honey and any number of fruit and vegetables. To add to this bounty, Cornwall is now starting to become known for its innovative and delicious chocolate creations. Needless to say, I am absolutely thrilled about this. Here, I am highlighting just a very few of the wonderful products Cornwall has to offer. I am hoping that this will become a regular feature and I can bring you more. Cornish produce is well worth trying. Oh chocolate is a wonderful thing. Very excitingly, Cornwall now has its very own bean to bar chocolatier, The Chocolarder. Joining the ranks of Willie Harcourt-Cooze and Duffy Sheardown, Michael Longman is one of only a handful of UK chocolatiers producing their very own chocolate. Using organic beans sourced from single estate, family run plantations around the tropics, the chocolate is ground by stone over four days and then hand tempered. You can tell good chocolate just by the smell; rich and complex cocoa notes will zip up your nostrils leaving you longing for more. When I unwrapped the chocolate, the whole room quickly took on the aroma – I couldn’t ask for a better air freshener. The packaging is plain and in keeping with the handmade purity of the brand. You can see the full range offered on the online shop. I am intrigued by the wild gorse milk chocolate bar. We have masses of wild gorse growing all around Cornwall and it is particularly noticeable at this time of year when it’s bright yellow flowers shine out for all to see and the distinctive smell of coconut wafts around in the sunshine. I have not yet come across anyone whose used it, until now. I must admit, I am no stranger to these truffles. Having come across them in Truro one day, I now make a point of buying some whenever I take a trip to Cornwall’s capital. They send me into such an exstacy, I can hardly describe them. The caramel is soft without being runny and is lightly salted, bringing out the flavour rather than overwhelming the palate. I was pleased to note that the salt used is Cornish Sea Salt. I’m often disappointed at the ratio of caramel to chocolate, but these are just about perfect. The 65% dark chocolate shells are not too thick and not too thin either and there is plenty of caramel. 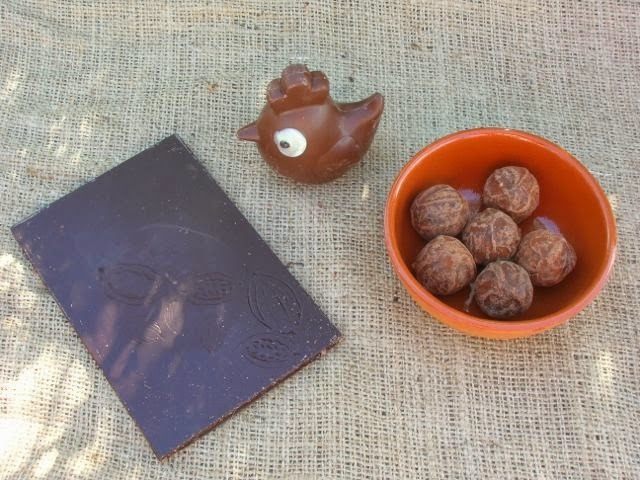 The Peruvian chocolate has an enticing aroma with notes of tobacco and spice. With Easter fast approaching, I shouldn’t have been surprised to find an Easter treat in my parcel, but I was. I might just have let out a cluck of excitement when I saw this cute little chick. The scent of chocolate with caramel notes wafted up making me eager to stop looking and start tasting. Weighing in at 100g, this is not one of those disappointing forms that turns out to be a hollow shell. No this is solid through and through and falls neatly into two halves when the first bite is taken. This makes it easy to eat and easy to share – if you can bear to. With a cocoa content of 40%, this Javan chocolate is creamy but not overly sweet, just how I like my milk chocolate to be. Made with only three ingredients and no masking flavours, this is milk chocolate at its purist. The first thing I noticed about this very dark bar of chocolate, was the delicate cocoa pods etched into the bar. Whole cocoa pods and halved ones showing the beans inside are there in extraordinary detail I thought. The next thing I noticed was that the cocoa beans were Criollo, the rarest and finest beans to be grown. Complex chocolate notes emanated from this bar with tobacco being at the fore. The flavour was strong, but not particularly bitter and as it melted on the tongue the tobacco notes were followed by fruiter ones. As in all good quality chocolate I have tried, there is a drying sensation in the mouth, but the chocolate was beautifully smooth. The taste of rich tobaccoey chocolate lingered for quite some time. As in the Naive bars from Lithuania, the information given about the chocolate goes into fine detail: bean origin Dominican Republic; bean variety Criollo; grind length 80hrs; batch number 2 and cocoa content 80%. Raw Chocolate Pie is a product I have been a fan of for many years now. Again, I first came across it in Truro, but was later able to buy it in Liskeard at Taste Cornwall, a shop selling only Cornish produce. Sadly the shop closed a couple of years ago and I can no longer buy my pie here. As the name suggests, these chocolate pies are made with only raw ingredients. They are gluten, dairy and sugar free, so a sweet treat you can indulge in without feeling the least bit guilty. Although they weigh in at only 60g, they are quite rich and filling; this makes over consumption at one sitting quite hard to achieve. These days, the pie comes in lots of different flavours, twelve to be exact, but the ingredients remain raw and few in number. The base ingredients consist of raw cocoa nibs, coconut butter, agave nectar, lucuma powder and carob flour. The distinctive flavour of carob is very much present; I find it melds well with chocolate and the raw and healthy nature of the pie. Cocoa nibs give added interest by providing a crunchy texture. I have tried a number of different flavours over the years, but chilli fiend that I am, the chilli pie remains my favourite. I particularly love the packaging of these pies. they are simple, yet colourful and fun at the same time. They also contain a fair amount of information in a small space without looking overcrowded. Produced by Living Food just outside St Ives, I’m really pleased to have seen the company grow in the years I’ve been enjoying the product. You can buy these raw chocolate pies in a number of retail outlets in Cornwall and also via the online shop. Colourful when you slice into it, the red of the goji berries and the green of the pumpkin seeds make this one particularly attractive. Packed full of flavour, it has a crunchy consistency which keeps the pie in the mouth for longer. Softer than the previous pie, but equally crunchy, this one is full of nuts: almonds, pecans, hazel and macadamia. The only crunch here is provided by the cocoa nibs but the flavour is really enhanced by the salt. Liskeard can boast a number of excellent food producers, but I am only highlighting one of them this time. Gingham Chicken is an award winning fudge company that makes delicious fudge entirely by hand. Supporting local traders is very important to Gingham Chicken; as many local ingredients are used as possible, including cream and butter – something I heartily approve of. Ingredients are kept to a minimum and nothing unnecessary is added. Fudge is sold in 100g bags or 250g boxes if you don’t think a bag is enough. There are a wide variety of flavours with Cornish Sea Salt and Pecan being one of the most popular. The tag line “a little bit of indulgence to make your world a more scrumptious place” says it all really. I am reviewing the three available chocolate flavours, yes that’s right, three! I can honestly say I was unable to pick out a favourite, all three were equally scrumptious. You can buy the fudge here in Liskeard at the shop Jelly Pebbles, as well as a number of other local retail outlets, at various food fairs and online. Liskeard really is worth a stop if ever you are passing by on the A38. I’m always slightly wary of orange flavoured chocolate as I often find the orange tastes artificial and sickly. No such worries here, the orange is fresh and tastes like real orange and both the aroma and flavour of rich chocolate comes through loud and clear. It has a light crumbly texture that just melts in the mouth. It is quite simply delicious. Just the thought of raspberries had my mouth watering. Summer and the raspberry season still feels like a long way off. This fudge looked really attractive too with the liberal addition of dark red raspberries contrasting nicely with the white chocolate fudge. I was not disappointed, this fudge really tastes of raspberries. White chocolate can make confectionary overly sweet I find, but the raspberries counterbalanced any possible sickliness resulting in a creamy fudge which is really quite delightful. Inspired by the cocktail of the same name, this fudge contains chocolate, hazelnuts, Baileys and coffee. I was all agog to try this one. I can see where the name came from. There are lots of flavours going on here but blended so well, they were really quite subtle. All but the hazelnut, where the nutty chunks are not only flavourful but provide a good chewy texture to the otherwise light and crumbly fudge. Made by the same folk as the Cornish Sushi Company, I came across this at a Christmas fair in Wadebridge. It is to be officially launched on the 1st of May, so look out for it then. So many hot chocolate mixes are overly sweet I find. This one isn’t. It still does the trick for those of us with a sweet tooth, but allows the taste of the chocolate to really come through. It is thick, creamy and delicious. Just heat 250 ml of milk and whisk in 30g of the hot chocolate mix. Ideal for sharing with the one you love, my Mugz came in a 60g tub, enough to make two mugs of hot chocolate. I have been using Cornish Sea Salt since the company was first launched back in 2008. I use it in my bread making and would find it hard now to contemplate any other. Cornish coastal waters are one of the cleanest in the UK and the salt harvested from them contains over 60 trace elements which are said to help the body metabolise sodium as well as contribute to general health and wellbeing. Interestingly, salt was made along these shores way back in the Iron Age. Not surprisingly, this salt tastes of the sea. Although flavoursome it is quite mild and not like some other salts which can be quite harsh. This is also my salt of choice when making salted caramel. Now it just so happens that I’ve recently made some Cornish Sea Salted Caramel Brownies featuring this very salt and I will be posting about them soon. When I was sent this pot of salt flakes, I was a little surprised to see the colour of the pot had changed. It took a while to figure out that the clue is in the name and these were flakes rather than the normal large crystals I buy – perfect for sprinkling over a brownie! And last but by no means least, I have a selection of creamy produce from the Rodda’s dairy. Rodda’s are best known for their delectable clotted cream which has grown from strength to strength since they started making it way back in 1890. I grew up with clotted cream, made by hand from the milk produced by a couple of Guernsey cows in the village. It was an occasional treat, to have on our Sunday porridge or apple crumble. There are many producers of clotted cream in Cornwall and some are better than others. Rodda’s always has a thick yellow crust on the top of their cream. This, in my book, is always the best bit and a sure sign of good quality. No cream tea worth its name should be served without this glorious accompaniment. I served mine on the saffron buns I recently made with a choice of my own homemade Cornish bramble jelly or blood orange curd. I know I shouldn’t say it, but I really can’t resist. The cream really is best served the Cornish way, on top of the jam (or curd). This means, not only can you generally get more on, but your teeth sink delightfully through the creamy unctuousness which is lost if the jam is on top. As well as the cream, I was sent a 250g pack of butter and a pot of clotted cream custard. The custard is a new product and is as good as it sounds. You really can taste the clotted cream. We polished it off rather too quickly. I served it with the above mentioned brownies (recipe appearing soon) and it was the perfect accompaniment, both when they were warm and when they were cold. We didn’t heat the custard as it really didn’t need it. In fact, it was so delicious, I had a hard time not eating it straight from the tub. The butter was just how I remember butter being when I was a child and we bought it straight from our local dairy (the afore mentioned Guernsey cows). It has a beautiful yellow colour to it, indicative of true pasture fed cows and a wonderful creamy taste. It’s the sort of butter you want to eat on your toast or saffron buns and although I used half of it in my brownies, I sort of felt it was a bit of a waste of good butter. The butter is salted. I am so used to unsalted butter or slightly salted that I was rather taken by surprise on first tasting. But my goodness it is delicious and really quite addictive. Thanks to all of the producers mentioned in this post for providing me with samples of their produce. I was not required to give a positive review and as always, all opinions are my own. Wow, what a fabulous selection of products. Cornwall has always had a great reputation for fudge and that white chocolate and raspberry sounds like a delicious combination. I’m intrigued by the raw chocolate pies too, I’ve tried raw chocolate on it’s own and it wasn’t for me but I like the idea of the mix of ingredients. Clotted Cream speaks for itself – yum! The other products sound good too. Great round up, hope to see more in the future. Thanks Janice – it was a real labour of love. Definitely worth it to promote such good Cornish produce though. That fudge was lethal – I polished the whole packet off this afternoon, it was so good. What a lovely collection of Cornish produce!! Thanks Heidi, this is only a very small selection of what Cornwall has to offer. Those raw chocolate nut pies have my attention! So you know that I am going to come visit you right – and try all those lush goodies. So many lovely products coming out of Cornwall. I have heard of Roddas but not had the chance to try their cream yet. I will definitely be visiting the Chocolarder when I next visit cornwall. Tina, Rodda’s cream is well worth trying, its available in many supermarkets I believe. And The Chocolarder truffles are to die for! I buy Rodda’s clotted cream from my local supermarket and it really is the best. Well done Cornwall! When I was a child living in N. Devon my mum would send me to the local dairy with a dish and 2 shillings to buy clotted cream. Of course that was a long time ago and h&s regulations wouldn’t allow this now, but that cream was the best I’ve ever tasted. Oh I agree, childhood cream was best ever. It was h&S that closed our tiny dairy down as she didn’t have the money to upgrade her kitchen to the required standards – very sad. What a nice roundup of local Cornish treats. My husband grew up around North Cornwall and we go down as often as we can. It’s worth seven hours in the car with toddlers! I’ll keep an eye out for some of these chocolate treats! That is some old drive for you, but glad you think it’s worth it. Living in Cornwall, we always seemed to have to drive for hours to visit family. We had some in Scotland and the roads weren’t anything like as fast as they are now. Thanks for the tip Janie. Is there a food fest or new market or something coming up in Looe? Thanks Vohn. I’m a bit biased of course, but Cornwall is really going some with its food now. Oh you are a lucky blogger to live in Cornwall with this veritable feast on your doorstop! So many delicious goodies. You’ve definitely sold me on the Seasalt Caramels but the Raw Chocolate Pies sounds super-intriguing and delish. Lucky, lucky you! STOP IT. Just. Stop. 🙁 lol. My husband want to move to Devon (I know, I know, not Cornwall, but it’s close!) & I’d TOTALLY live down there, too. All of this has got me jonesin’ for Cornwall even more. *sigh* Lucky little thing, you! Roddas and Cornish Sea Salt are both favourites of mine, but all those lovely chocolates! Yum!! The sea salt caramel truffles sound amazing. That is my favourite flavour chocolate. I am looking forward to seeing your Cornish Sea Salted Caramel Brownies recipe. Sounds right up my street! Wow what a wonderful collection. You do indeed live in a fabulous area for sheer beauty & produce. Wish it wasn’t so far to visit. What a lovely section of products. All you need is a glass of Camel Valley fizz to wash all that chocolate down!